The folks at NaNoWriMo are best known for putting on one hell of a 50K write-a-thon each November, but did you know they also have Camp NaNo in April and July? Well, yep, they do. The main difference is you set your own word goal of 10K or more, so participants can choose to write the minimum or shoot for the moon with 100K or more. In NaNoLand, the sky’s the limit. You can sign in with user name from the regular site, if you already have one, or create a new one. Camp offers it own bull’s-eye style progress chart, cabins full of other participants ready to bond between word sprints, plenty of inspiration to help you bang out the first draft of your next new novel, awesome sponsor offers (including major discounts on Scrivener and Aeon Timeline), and a whole lot of creative fun. So, are you in for the April writing frenzy? 1) My 2014 NaNo t-shirt, with the cool steampunk logo, in extra-large so I can wear it for a night shirt and just pull on some yoga pants in the mornings. 2) Every busy writer needs a loyal friend to bounce ideas off of, and to tell you when you need to step away from the manuscript-in-progress and take a break. 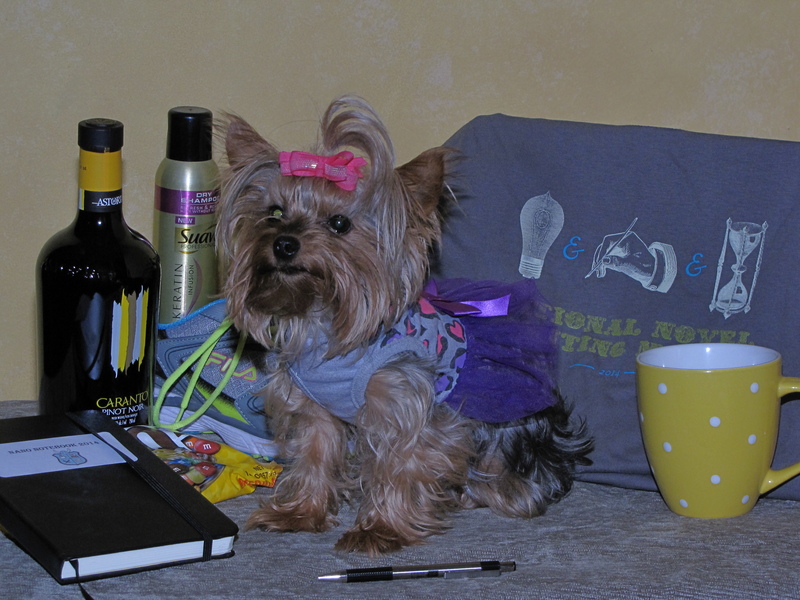 That’s my Yorkie’s job, Little Miss Scarlett in her purple tutu. 4) A NaNo notebook and a good ink pen, to keep all your fabulous ideas straight, and maybe jot down a few lines of dialogue or scene descriptions on the go. Also a good place to keep outlines or character sketches. 6) A good pair of walking shoes, to wear on my afternoon walk when I can pull myself away from my desk. So I don’t forget what sunshine looks like during NaNo season. 8) and Vino! What better way to celebrate getting your wordcount each day that with a glass of wine. A little chardonnay or pinot noir can also help you reach that goal, though you might want to stop after half a bottle or you may not be able to make sense of what you wrote the next day. What’s in your NaNo Survival kit?